Split Blade Strat Pickups: a Lindy Fralin original! Designed as a fully noise-cancelling replacement for Strat-style pickups with all the high-end clarity you expect from a traditional single coil. As always, Lindy Fralin Guitar Pickups will give you the most clarity, articulation, and string definition you can get – period. 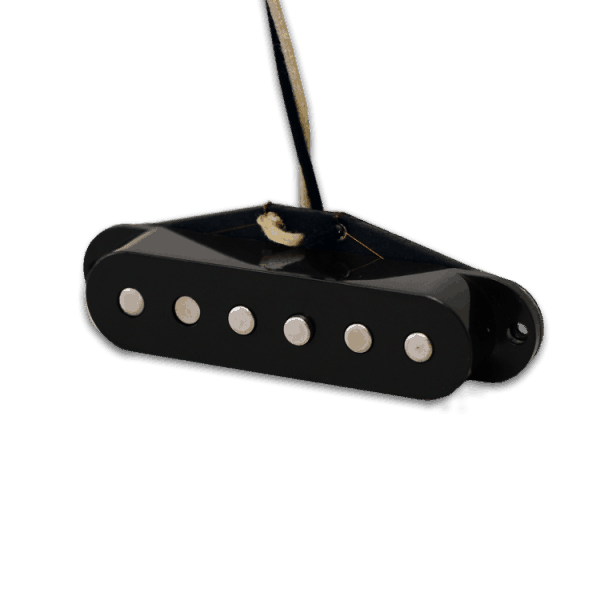 Split Blade Stratocaster Pickups: The revolutionary design in single-coil sound, without the hum. 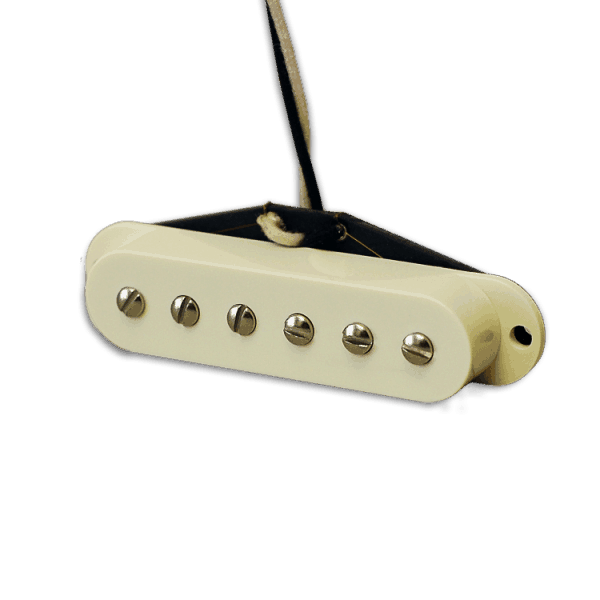 This pickup is built with a 2-coil design using steel blades for the pole piece. 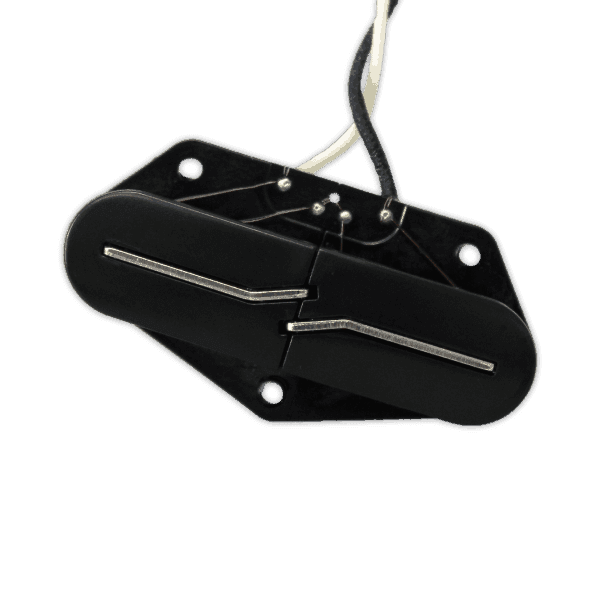 Unlike most humbucking pickups, Split Blades are designed with a left and right coil design, offering a truer and more balanced single-coil tone. 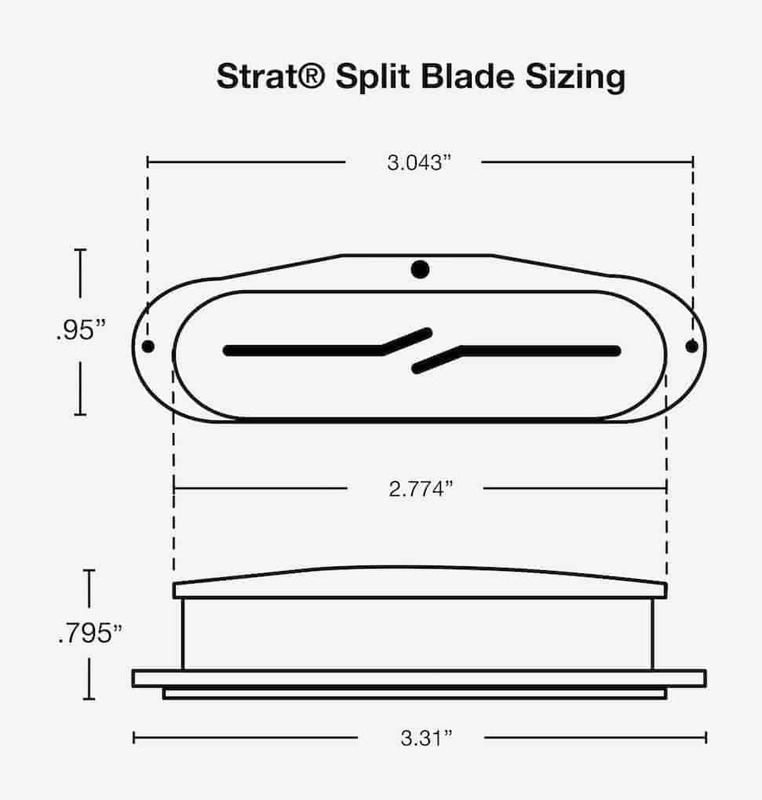 You can expect a traditional single-coil tone from Split Blades, except with a bit more fatness and warmth. Split Blades are perfect for those who love the tone of their guitar, but want to rid themselves of the noise. Our manufacturing process allows us to achieve unparalleled quality control. Split Blades consist of a precision injection mold and USA-Made Steel Blades. We use a variety of USA-Made magnets to make this model loud and efficient. Each bobbin is carefully inspected and cleaned before winding. Lindy Fralin Split Blade Pickups are unique: they offer a single-coil sound, with no hum, whatsoever. You can expect fantastic warm, full-bodied tone with incredible string articulation and enhanced detail. Low strings sound clear and articulate, while the plain strings sound thicker than a single coil, but still sparkle. Also, adjusting the pickup on the Bass and Treble ends really allows the player to fine-tune the pickup to his or her needs. Split Blade Pickups will not pull the strings out of tune – even if they get close to the strings. When playing with distortion, Split Blade Pickups sound thick and dynamically rich. Chords have a nice compression on them while single note lines have a much larger sonic footprint. 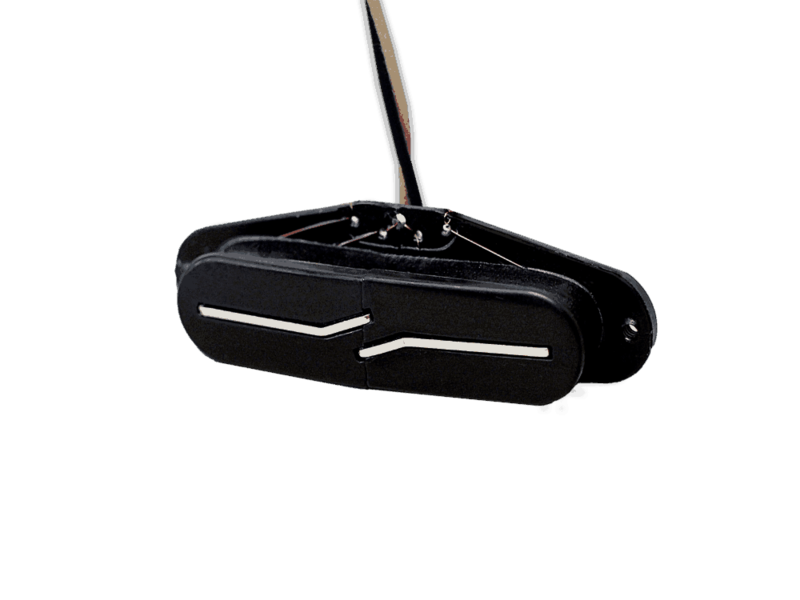 Split Blades sound thicker than our Vintage Hots out of the box in our Vintage output option. What Output do I choose? Good question. Vintage and High Output models sound best with 250K pots. Blues and Super High Output models sound best with 500K pots. Basically, if you have the right pot installed, Vintage and Blues outputs will sound the clearest and most “Fender-y”. 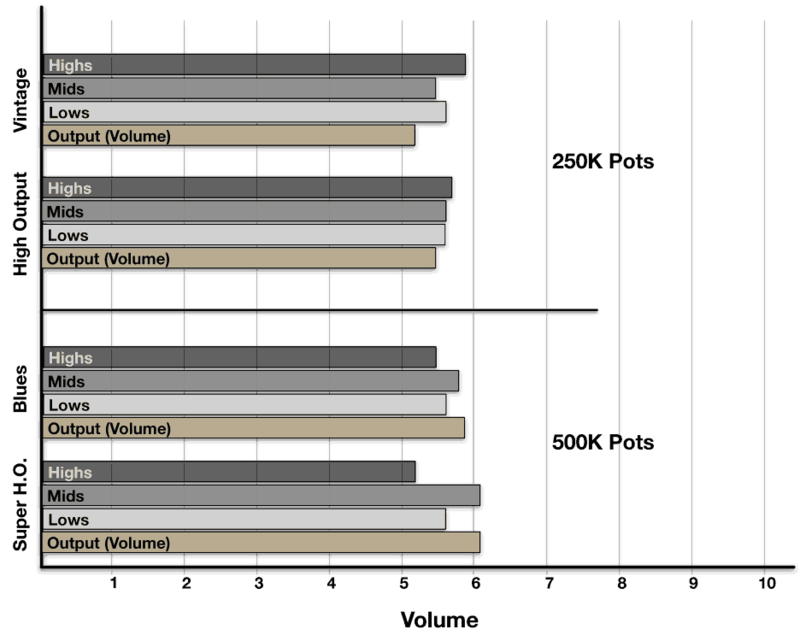 Their higher-output counterparts will sound thicker and break up quicker. What Radius do I need? How will this pickup differ from a standard Strat pickup? The tone is very similar! Whenever you have two coils in series like a Split Blade, you’re going to lose a bit of that Fender “sparkle”, but we believe these are the closest you can get to the real thing. How far away from the strings does the pickup need to be? Split Blades like to be closer to the strings than a normal Strat Pickup. Check out this video here. Split Blades are wound by hand with 43 Gauge SPN wire, with Ceramic magnets. Split Blades read a lot lower than most pickups due to them being so efficient. Don’t go by ohm readings – they won’t give you any accurate information. Our Split Blades will “Meter Down”. They will match most everything that we make. If buying a single, request a “3-Wire”, where we separate the ground from the coil, allowing you to reverse the coil if need be. Great way to get that strat sound with no hum. Replaced the original single coils on my strat – they were so noisy in that could not use them other than out of phase – now I have the whole strat palette and love these PUPs. Put the high output in the bridge with vintage in mid/neck- and it’s perfect. Umph in the bridge, quack in the middle positions. Great sound, the split blades sparkle really sparkle! 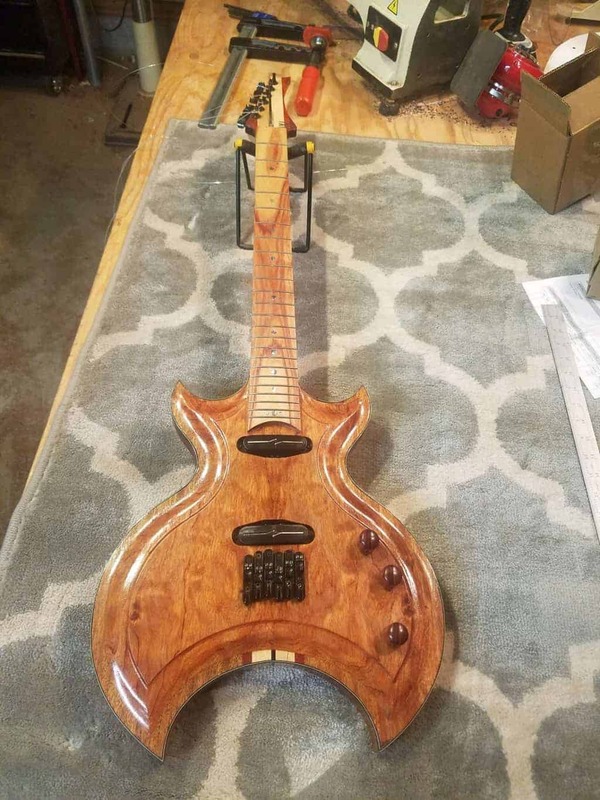 I am custom building, and I put these pickups into one of my builds that has a the Gibson 24.625 scale with neck and bridge positions – not replacements on a Strat – Sacrilege, I know. 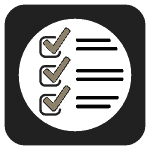 (I left out the middle position pickup and now have a spare.) I was not prepared for the amazing sound. Clear, articulate, balanced, with a bright attack that caught my full attention immediately. Definitely a blues-derived sound with rich bass and mids, and clear highs that remain balanced when played in the clear channel, or awesome grunt with overdrive. To my ear this hit the blues/rock target spot on. If this is the sound you like, then these are the pickups that best deliver it that I have ever found. Cannot say enough about them. And to top it off, the customer service was just right. 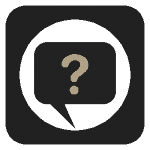 When I received the pickups, one was defective – no output. I asked about a return and right away a replacement was dispatched with a request to return the defective unit. Fast, friendly, and no one made it my problem. Another mark of an excellent product and company. Lindy, you knocked the ball completely into Tomorrowland with your Split Blades!!! After installation, just a few adjustments brought the sound quality of the century to my ears. The fullness of sound sets my soul on fire. Being mostly a slide guitar player I crave that rich bottom end, healthy mids and that sweetness of the upper end. You nailed it a thousand fold. There is no loss of articulation when playing that full Delta style. None of the notes interfere with each other. I’m now craving to outfit my other slide guitars and finally my stand tuned guitars…one step at a time. The pickups produce an amazing clean tone and are totally without any hum or noise. The construction is and finish is excellent. Thank you! 2 Vintage Hot and 1 High Output – Excellent combo. At the recommendation of Lindy, I used Vintage Hot in Neck and Middle and High Output on the bridge. I wanted to be able to solo or use High gain with the bridge w/o using a Humbucker. But the Vintage hots do a very good job of handling Gain and Overdrive as well! Still get the Position 2 and 4 Strat quack which is awesome. The tone is clean with rich string resonance and harmonic overtones. Exactly what I was looking for. Using an Orange Pro Combo and Ritchie Kotzen OMG pedal, I get just what I need. From clean to some fairly heavy OD. Next Lindy was gracious to talk to me and we had a nice chat at the shop the I picked them up as well. These are the real deal. They have very low magnetism so you can place them near the strings, and they follow your neck radius as well. Built them in a couple of days too. Highly recommended. Fralin is the place to look! I’ve gone through every blade style noiseless single coil pickup out there and this is hands down the best sounding pickup that retains the single coil feel and vibe. Sounds great through clean and high gain settings. Quiet vintage mojo. Friggin’ awesome tone and articulation. Well worth the money. Totally noiseless great chime and well focused. The answer to my prayers. Authentic single coil sound without the noise when using distortion. Very happy with these and will be buying more. I bought the SHO model for the bridge position on my Strat. I worried at first that I might lose some high end as with most very high output pups tend to sound a bit dull at the expense of output. But I worried for nothing. It has all the top end I could ever hope for in a bridge position pup with a good amount of gain. But don’t be fooled into associating this SHO with commercial brands claiming the same thing. This pup has superb definition and gobs of touch sensitivity. A nice amount of output suitable for classic rock soloing. But it’s definitely not of the Super Distortion variety. Overall a super choice and I couldn’t be happier. I replaced a Lace Sensor red model which produced too much hum in some of our regular venues. I liked the Red quite a lot and had shopped hard and did my homework before selecting Fralin. I’m very pleased to say that it plays very well with the Lace Sliver and Blue pups in the middle and neck positions. I was concerned about it blending well with the Lace models but again, the worry was for nothing. Bonus is the bump in the lower tones over the Lace Red. The Split Blade has just enough in that area to make power chords jump, but with clarity. I’ve never experienced this kind of depth of sound in a pickup before. So, if you are seeking a very responsive and touch sensitive pickup that hits the front end of your amp a bit harder than most, the SHO is a great choice. And it cleans up very well when the volume is backed off. Perfect. Split blades — vintage/vintage/high output — went into an “S-type” from a StewMac kit. I was surprised (maybe I shouldn’t have been!) 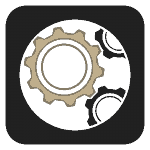 that the sounds I am getting closely matched the sounds in Lindy’s video, which was what I was looking for. Although friends had said the pre-Lindy sound was just fine, I’m blown away by the improvement. Thanks! I purchased my split blades from Lindy directly. I did a strat guitar build using a quality Warmoth body and neck. I installed vintage split blades in the neck and middle positions, and a blues split blade in the bridge position. It’s a pretty trick set-up. I play a lot of Funk and Soul and I get out of the split blades what I wanted. I am glad I bought them. It’s bad enough so many of us play strats, but mine looks a little flashier and stands out a bit more thanks to the split blade design. I purchased a Fralin Split Coil set (Vintage – N, Vintage – M, Super High Output – B) to replace the Duncan APS1 pups in my Knaggs Choptank T2. I wanted to loose the noise/buzz from the SDs and since the Split Coils are offered as a upgrade option on the T1 Choptank they were my first choice. Wow – what an improvement!! Yes, the noise was completely gone but I wasn’t expecting the TONE. Each pick up has it’s own character but all are well within the desired ‘strat’ tonal range.. just richer. Adjustment was very easy.. initial balance between the pickups and low to high strings was a breeze to achieve (the design does the work). The output between all pick ups was well balanced even when using the ‘in between’ switch position for middle (V) and bridge (SHO). The neck ‘vintage’ pup is FAT .. super clean but one of the fullest sounds I’ve heard. The SHO has just enough extra output to push your leads over the edge, when you want, without being too conspicuous. I have Lindy’s ‘Pure PAF’ humbuckers in my Knaggs Sheyenne, which I love, and now there’s no question.. Lindy Fralin simply creates the best pick ups on the planet. I originally ordered SP42’s for my Carvin Strat clone. When I installed them, the pole piece alignment was too far off for my comfort due to narrow string spacing. I couldn’t hear a problem, I could just see it. I called Lindy and he noted that this would be a non-issue with the Split Blades. I swapped the SP42’s for Super High Output Split Blades. They are amazing. I was concerned about equal string volume without adjustable pole pieces. Fralin has compensated for that with varying height in the blades. With the correct radius, the volumes are spot-on. Another benefit that I noticed, which I haven’t seen mentioned anywhere, is that there is no hot spot on the bass strings. The frequency response is very equal end to end! These produce the clearest wound string tone of any high output pickup that I have used. They respond well to the guitar’s variables. There is no string pull, signal is strong, clear and delicious! Try ’em, you’ll love ’em. Thanks to Lindy for his time & advice!! love the vintage blades look ma no hum! Had a set of vintage hots in a strat i built They were awesome. If you ain’t happy with your sound i’m sure lindy makes something you’ll like! One word – amazing!! Put vintage split blades in the neck and middle position and high output in the bridge and you’ll never want anything else on your strat. These pickups make your guitar sound ultimate, just like premium instruments. You don’ t have to spend thousands on custom shop guitars – if you love the wooden mate you have, just invest in the best pickups you can possibly get! Truly!